Official Site. Kids Stay and Eat FREE. So You're FREE to relax. Enjoy Comfort and Convenience at This Frisco Hotel Surrounded by the northern Texas landscape and yet only a short drive from Dallas, the 100% smoke free Holiday Inn Hotel of Frisco - Plano / Stonebriar offers an ideal location for all types of travelers. Situated near Plano and in the heart of Frisco, our hotel is just minutes from a shopping excursion at the Stonebriar Centre, a ballgame at the Dr Pepper Ballpark or an indoor rock-climbing adventure at the Canyons of Frisco. Our hotel's guests may also enjoy exploring the culture of the Dallas - Fort Worth area, just a short drive from downtown Frisco. Lodging in our hotel near Dallas provides business travelers with easy access to JCPenney Headquarters, Ericsson, McAfee, Pepsi Company and other businesses in Frisco, Texas. Our hotel's amenities include meeting space and a business center offering print, fax, and copy services to meet your business needs. We go beyond other Frisco hotels to offer a stress-free environment. We serve American cuisine in our Naya Grill Restaurant and great drinks. In addition, our Plano area hotel features an outdoor pool and fitness center. Each room is outfitted with triple-sheeted bedding and high-speed Internet access to ensure a relaxing stay in Frisco. 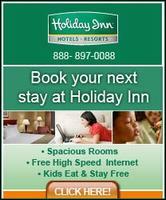 Lodging in the Holiday Inn Hotel of Frisco - Plano / Stonebriar gives you the comfort and quality you deserve. No reviews were found for Holiday Inn-frisco.